Do you know what happens when I don't post for several days, or in this case nearly a week? I find it extremely difficult to focus on one topic and compose a coherent post, that combined with a lovely case of the flu my son and husband were so kind to share with me. I think I remember typing something very similar just after Christmas. It seems Santa Claus and the Easter Bunny have it out for our family. One bought with the flu a year is plenty if you ask me. Mitch spent the week in bed completely miserable. Casey joined him about mid week, so when I woke up this morning feeling a little off, I knew what was coming. I just looked back at my archives and the post I was thinking of wasn't after Christmas it was in October, That make 3 rounds this year, not two. 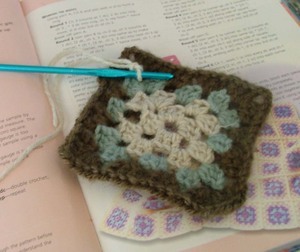 Anyway, looking back at the October post I see just how long I've been trying to learn to crochet. I guess some things don't come easy for me, but I am persistent. I'm not saying I've been trying every day since October. No, I pick it up, get frustrated and put it away for weeks or months. This week I think it finally clicked. My fingers figured out what they were supposed to do and I actually produced something that sort of resembled what I was shooting for. Don't try clicking it to make it larger, I don't want you looking that close. It's very wonky and a long, long way from looking like anything seen here, but I am so psyched to have actually followed the pattern. I'm telling you, this may be the easiest thing in the world for some, like second nature, not so for me. Finally though, my fingers found the rhythm and it started to feel right. Just in time, since it seems I may not feel like doing anything else for the next several days. Monica and Sandy included me in a listing of 5 blogs that inspired them and I in turn am supposed to spread the love and name 5 blogs that make me think and inspire me. Ladies, how can I name just 5? My bloglines has grown to about 99 blogs and they all inspire me in one way or another or I wouldn't read them. Some provide creative inspiration, some spiritual, some make me laugh and some make me cry. My list would surely be much longer than 5 so I'll call this my partial list. When I think of who makes me think, someone who is inspirational, one of the first to come to mind is AfricanKelli. Even though she's much younger than me, I want to be just like her when I grow up. She's such an all around good person who actively makes a difference in so many lives. Kristy's blog Vintage Pleasure is just that, a pleasure. A pretty place to visit and you'll always find love there. Beki, ArtsyCraftyBabe keeps it real. Visiting her blog feels like dropping by an old friends house. She's inspirational with her talent but at the same time she's someone you can relate to. There are lots of blogs I visit for creative inspiration, but few are as approachable and real as Beki's. A winning combination don't you think? Megan of The Scent of Water is crazy smart with a wicked wit and she also takes beautiful pictures. And rounding off my 5, my buddy LLA, aka Bad Fortune Cookie. You never know what you'll find at her blog. She's a great cook and sometimes shares recipes, a talented knitter who makes adorable bears and bunnies, she's current with pop culture and frequently has fun observations to share, she's a speed reader and can always recommend a good book. Even before I met her I knew she'd be a blast to hang out with and she is. Even though the rules say 5, I'm breaking the rules and tagging Monica and Sandy back. Monica is another person I know I'd love to hang out with. Her bubbly personality shines through in her writing. She was the genius who shared her fabric folding secrets and for that I'll love her forever. Sandy is a beautiful person who shares her love of entertaining through her blog. She shares how entertaining doesn't have to be stressful and how important it is to connect with friends. I am grateful that after much encouragement I was finally able to convince my fingers to cooperate and let me learn a new skill. I am grateful that Monica and Sandy were sweet enough to let me know they find some inspiration here. Thank you ladies!! Now I'm going to settle in on the couch and be grateful for tylenol, a cozy blanket, some warm tea and plenty of yarn to play with.